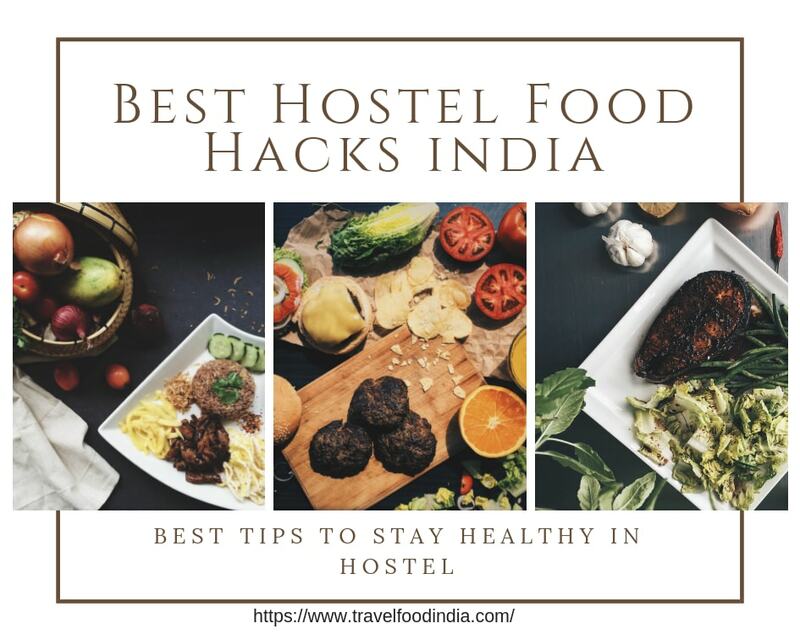 Best Hostel Food for Indian Students- We always have that mindset that Indian hostel food is not good enough to eat and stay healthy but today I will give you 100% unique ideas that make you healthy. In Indian, Hostel food is not like we usually eat in our day to day life at home but it's a simple meal. Indian Hostel students usually used to those meals which include Rice, Roti, Sabji etc. So its very difficult to stay healthy. Keep in mind that hostel life is very different from home. In Indian hostel the surrounding and set us are different. I have been a hosteller for 10 years and have collected hacks and memories. 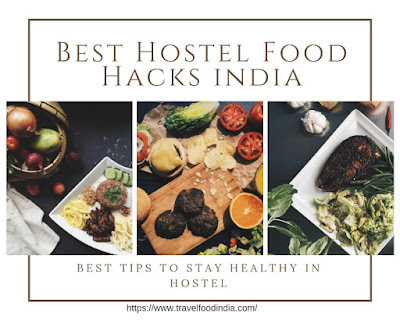 Today I am going to tell you about the Best Hostel Food Hacks India. It's very difficult to get raw vegetables like banana, mango, Orange, grapes in Indian hostel. Hostel mess does have some vegetable like carrot and brinjal which is not eatable. you could do one thing just buy from local vendor keep those in your hostel room, that would be a great idea to eat healthy food in the morning. In order to balance your body, you need to take at least some raw fruits so that you can manage your body at any hostel. Vitamins & Minerals are considered as one of the prominent nutrients and also essential for our body. Its performed thousands of role in our body. I suggest you take some amount of fruits and vegetables to maintain the body. It is said that ''Water is Life'' that means without water we cannot live a single day. The human body needs water to survive, it's about 60% of our body content waters. Make sure to carry a water bottle with you when you feel thirsty it would be useful to you. The benefit of water is to boost your metabolism. I would suggest you take 5 to 6 liter of water every single day. Buy some water bottle from Amazon or any local store and make use of it. Drinking an extreme amount of water in the day it cause many problems. Meat is a good source of protein, it helps the body to work efficiently. Eating chicken or mutton will give you enough vitamins or fat to run your body smoothly. Excessive use of meat can lead to various diseases like coronary heart disease. I would suggest you take 2 times a week it may be chicken or mutton or eggs, fish etc. For those people who are not like to take Non-veg, they may find very difficult to survive because if you are not taking animal protein then you have to take a huge amount of raw vegetable or some vitamin tablet to make your body run smoothly. Balance your body by taking meat twice a week. What do you mean by Breakfast? What happens when you take breakfast? a lot of question going on in our mind but there is one solution which is taking a healthy breakfast. I would suggest you take 2 banana or some milk and bread in your breakfast. Why I am giving you such crispy suggestion because it gives you energy and makes you alert throughout the day. I would suggest you have nut butter, milk, Tomato toast, white bread, boiled egg or egg white etc. A human body made of 60% water, 17% fat, 5% carbohydrate and rest are protein. In order to maintain your body, you should balance the diet plan. I would suggest you take some necessary medicine and keep for yourself in the hostel. Basic medicine like Multivitamins, Antibiotic etc. Eat 100 calories fruits and vegetables or some food that contains fat. It is said that ''Health is Wealth''. That means take care of your valuable health if you are not taking necessary steps towards health that might cause you a little bit. So be careful what you are eating or drinking. Here is an important article for you to understand ''21 vegetarian recipes for hostel students''. Easy meals like Eggs, Easy tomato omelet, Salad, Boiled potato etc. You can also order glossary from Amazon or Flipkart. I know it is a top decision to stay in a hostel where these kinds of food were served like Dosai, Sambhar, Idly, Roti, Chutney etc. If you looking for Hostel menu or wanted to know more about Indian Hostel Menu the then check out this post. I would rather say in this way that you should choose according to your wise but one thing need to understand your body. Junk food is basically a kind of food which is prepared or not nutrient that may cause your body. Indian hostel students are so curious about junk food because of it so testy and they would not able to sustain their lives without taking this kind of junk foods. these food are not appropriate for health, I would suggest you avoid this food to stay healthy. India is famous for its spicy food and street food. We usually take junk food in our breakfast or evening snacks. For Indian Hostel students avoid this food, you would rather take milk or bread. I will give you a list of food that might cause your body- check out this post. Please avoid this food, instead of using these you can order food from Amazon (34% Discount). I know it sounds like simple but very necessary for hostel students to know. Make good friends within your class or hostel. If you share your thoughts or help other people they might help you when you get trouble. I will suggest you have looked in this videos WATCH THIS. Today I will give you a list of the name which is related to your hostel meal. Upma is one of the easy and light tiffins in India. It's made using wheat. Upma is originated from South India, also found in Srilanka. It is an easy and healthy breakfast. How to make Upma at Hostel check out this post. Maggi is a kind of noodle that is used for breakfast or lunch anything. Now Maggie is so popular in India that even a small child knows about Maggi. It is also a healthy breakfast for hostel students. How to make Maggi at Hostel? read this post to know more. Poha is also one of the leading Indian breakfast that exist throughout the decade. It is easy and simple to make also good for health. Poha is like rice that has been parboiled and went through the different process. Poha is considered one of the best breakfast for hostel students. If you are Wandering about How to make Poha WATCH THIS. The sandwich is a kind of food that consists of two slices of bread having a bunch of vegetable, souces, etc. I would suggest you try it. It is easy and simple to make in the hostel. If you are looking for recipes or How to make Sandwich then Watch This. I would not suggest you have Pakoda in your daily breakfast but you can take once a week. Pakoda is originated from South India. It is made of flour or mixes vegetable. It's very easy to make in the hostel. How to make Pakoda at Hostel? This is the easiest recipes to make in the hostel. It is healthy and tasty. I would suggest you add this dishes in a daily routine meal. Want to know how to make Egg Omlete? Noddle Salad also one of the finest light breakfast that exist in India. People loved Noddle salad especially those who are conscious about their health. I would suggest having some noddle salad in your breakfast or meal. How to make Noddle Salad? Pasta can be a part of a healthy diet. It is also one of the daily breakfast of the Indian people. Pasta originated from Italy. Pasta is good for health, make sure not to take huge in a short the short period. How to Make Pasta in Hostel? Kurkure is an evening Indian snacks which is based on rice meal, salt, cornmeal, spices etc. Kurkure Chaat is also a light evening snack for hostel students. I would say you can have it in your evening snack, not every day. How to make Kurkure Chaat? Fruit Salad is healthy for hostel students. Fruit Salad is a mixture of various chopped fruits. You can also make sweet juice out of it. I would rather say that fruit salad is one of the healthiest breakfast ever. How to make Fruit Salad? Pancakes is a thin, flat piece of butter, fried both sides. Pancake is a great option to have in your breakfast or evening snacks. How to Make Pancakes? Pizza is originated from Italy. It consists of round bread with different sources and tomato, cheese, pinates etc. This is also a great option to have in your breakfast or evening snack. You can enjoy with your friends. How to make Pizza? Chocolate Shake is a kind of beverage that usually made of sweet milk and chocolate. It is very sweet and delicious. This is also a great option to have on breakfast or evening drinks. How to make Chocolate Shake? Its a kind of salad mixing with Moong Dal, Chopped Onion, Cowpea sprout, salt, etc. It is considered one of the healthiest diets in our day to day life. Having sprout salad every morning can boost your body performance. How to make Sprout Salad? Hotdog is a long piece of bread(roll) topped with various condiments. Hotdog is also a usual evening snack but in India, it is not considered as breakfast or people not willing to have a hot dog in their breakfast. I would suggest having a hotdog in your evening snacks. How to make Hotdog? Pasta is originated from Italy having water, durum wheat, spices, with various shapes. Pasta usually takes as evening snacks. Pasta is well famous among teenager in India. Its good to have past once a week. How to make Pasta Salad? Chips Bhel or Bhel Puri is an Indian dish made of puffed rice, spices, hot chutney etc. Bhel puri is an evening snack. Everybody knows about Bhelpuri. Do not eat bhelpuri every day it may cause diseases. How to make Bhel Puri or Chips Bhel? Kathi Roll is an Indian based street food originated from Kolkatta. Fried mix vegetables or Eggs stopping in a bread or Paratha also lots of chutney. I would not suggest you have Kathi Roll every day. It is also one of the evening snacks of India. How to Make Kathi Roll? Curd Sandwich is also a Simple sandwich but its full of carrots, curd, bell paper, two pieces of flatbread little bit of cheese. You can take it as breakfast or evening snacks it's upto you. How to make Curd Sandwich? I know this is crazy. Coffee is one of the leading breakfast in India. Everyone loves coffee, one cup of coffee in the morning would give you an instant boost to work all day. How to make Coffee? This post is only for those who are studying or staying in any hostel you don't have a stove or microwave or any electronics but still, you can make it. What is your favorite hostel food? Which hostel food makes you feel good? let me know in the comment section below.